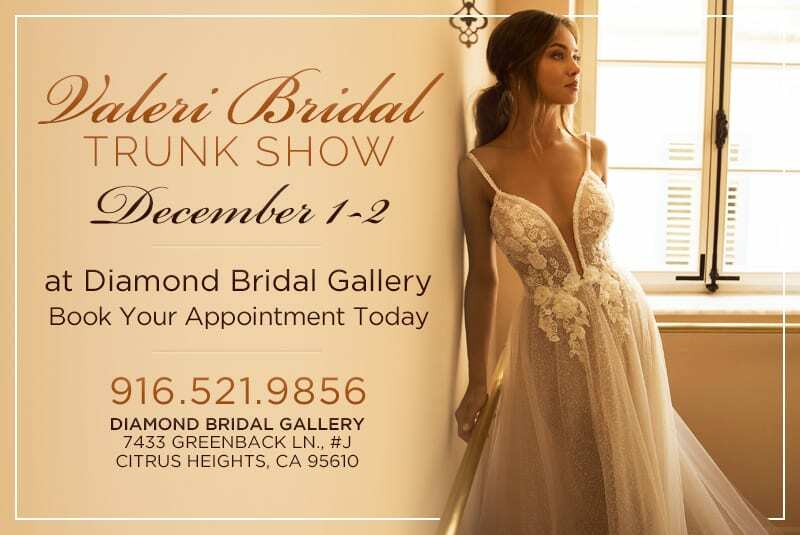 Valeri Bridal Trunk Show Coming December 1st & 2nd to Diamond Bridal Gallery! Want to find your wedding dress this December and beat the post-holiday engagement rush? There’s no time better than the Valeri Trunk Show, coming December 1st and 2nd to Diamond Bridal Gallery. Ethereal skirts, crochet bodices, and gentle ivory and blush tones are showcased in Valeri’s breathtaking collection of bridal gowns. Unlike many bridal designers, Valeri’s gowns embrace straps and cap sleeves, showing just how beautiful bucking the popular strapless trend can be. Be on the lookout for deep v-necklines, french lace, and floral inspired appliques. There’s a simple elegance and grace to Valerie’s wedding dresses. With diaphanous chiffon and soft tulle, you can keep comfortable and still elegant. Each gown is crafted around a central point of emphasis, whether that’s a daring neckline, delicate lace trim, or even a peplum cape train. Natural waists and princess seams reign supreme, but Valeri also throws in a few gorgeous drop waist gowns. If you’re looking for something light, full of movement, and with gorgeous feminine details, this is a trunk show you won’t want to miss. Book your spot today by contacting Diamond Bridal Gallery or speaking with a consultant.